Have you visited your area public library lately? If not you will be amazed at the quantity and quality that all the libraries of Hillsborough County have to offer in addition to books. And the great part is, access and use of the public libraries are free, including free wireless internet on computers and private meeting rooms. Only if you live outside Hillsborough County do you have to pay and that charge is a mere $100 per year. Michelle Michaud, above, is a new librarian and Branch Supervisor at the Ruskin Branch Public Library. 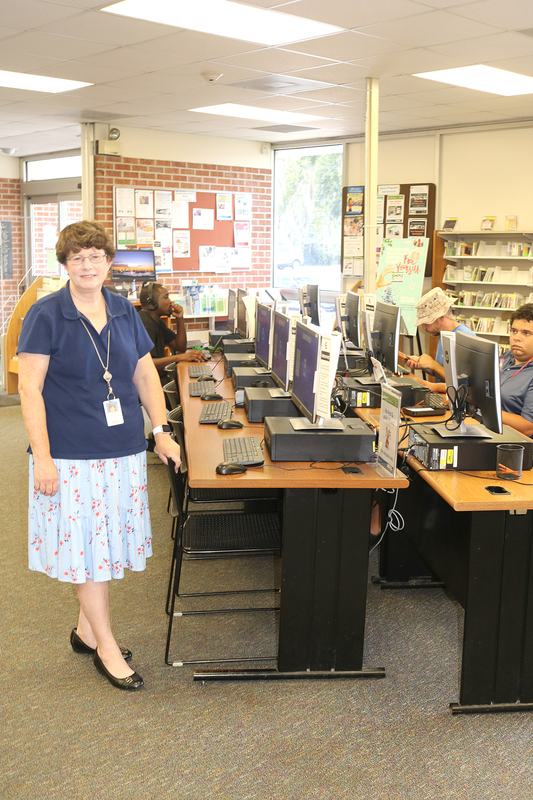 The various libraries in Hillsborough County have a variety of different services, events, and material so it is best to check the www.hcplc.org website or call to determine the hours of operation and what each library offers. The Hillsborough County system includes 31 branch libraries, a bookmobile, a cybermobile and a research center. That new librarian is Michelle Michaud, and she just started in Ruskin in late August as the new Branch Supervisor. Michaud grew up in Westwood, N.J., 14 miles from the George Washington Bridge in New York City. Michaud went to Westwood High School. She attended Rutgers University in New Jersey for an undergraduate degree in English Literature and for two master’s degrees: Elementary Education and Library Studies. Just by the statistics, Michaud reports that the numbers of patrons and customers at the Ruskin Library fluctuates. For this past August there were 5,127 visits and 6,883 items checked out at Ruskin. Ruskin, just as the other libraries in the Hillsborough system, offers more than books, magazines and reading materials. Michaud enjoys her work at the counter, in the stacks and dealing with the general public. “I like the many different ways we can help people here. Our work ranges from helping a child find the perfect book to assisting retirees with the new tablet they were given at Christmas. And it’s always nice to hear that because of the library, someone was able to finish their resume and get a job for which they applied,” she said. And, undoubtedly, the libraries as well.